In previous pages I mentioned the dangers of using slimming aids and weight loss supplements without first consulting your medical practitioner. See Understanding Weight Loss Basics – 4. The health authorities of both the UK and US have issued warning of the use of this illegal compound, yet currently, six deaths in the UK, and around 60 worldwide are attributed to DNP. Regardless of what it says on the container, there is no safe dosage, the line between safe and overdose doesn’t exist. slimming aids – the risks: how does dNP work? 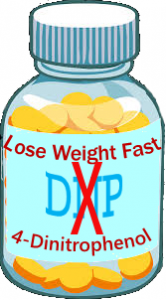 The main risk of DNP is that it accelerates the metabolism to a dangerously fast level. This causes the body to burn fat extremely fast and raises the body temperature to abnormally high levels. If the body temperature is allowed to carry on rising, and there has been a case of a persons body temperature rising to 43.3C, the body will virtually cook itself alive, resulting in organ failure, cardiac arrest, and death. Below are a list of slimming aids which have been tested by the US Food and Drug Administration and found to contain hidden drugs such as sibutramine, which can cause substantially increased blood pressure and the risk of strokes or heart attacks; and phenolphthalein, a chemical that can increase the risk of contracting some forms of cancer. Originally used as a prescription drug appetite suppressant and banned in Europe in 1999 by the Medical Approvement Agency as being unsafe but can still be obtained online. Used to treat urinary tract problems and incontinence in dogs. Not approved as a slimming aid. Used to treat Attention Deficit Hyperactivity Disorder (ADHD). misuse can lead to high blood pressure and increased heart rate and is not approved as slimming aids or weight loss supplements. Used in the treatment of asthma it is known to increase metabolic rate while losing fat and building muscle. Banned by the International Olympic Committee because of misuse by athletes, it is also used as a veterinary aid in the treatment of horses, again not approved as a slimming aid. Although it’s illegal to sell prescription only drugs on line that have been approved by various government health agencies, they have little control over them when they come from outside their country, particularly if they come via the postal service under plain cover. Many of these prescription only drugs are used successfully to treat many health issues but claims that they will help weight loss are, as any doctor or health professional will tell you, completely without foundation. Taking them without medical supervision will not only endanger your health but can lead to fatality, as in the case of the death of 21-year-old Brazilian model, Ana Carolina Reston, who died shortly after, it is thought, of having taken a cocktail of prescription drugs for slimming and pain relief. There are many other drugs that have not been approved by the various government health agencies that can be obtained online claiming that they are the answer to your weight problems. Don’t be taken in by their slick sales talk, saying how wonderful their product is and how it can help you lose weight easily and without effort. Never, ever buy weight loss or slimming aids online promising “lose 30lbs in 30 days”, the majority are scams and can only lead to health problems, tears and heartache. Unless fast weight loss is necessary for life-threatening reasons and under medical supervision, as I have reiterated many times on this website, there is only one way to safe and healthy permanent weight loss and that is by a healthy calorie-controlled diet. As always, please consult your medical practitioner before embarking on any weight loss, fitness or dietary supplements program, this can save you a lot of disappointment and heartache in the future.